On the Nose it gradually unfurls flowers, fruit, spice and gunflint in an intriguingly absorbing array of earthly wide-ranging aromatics. 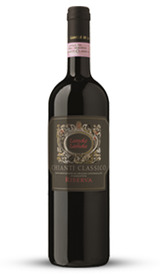 Sangiovese's austere tannins are firmly in the traditional mould, underpinning progression on the subtly nuanced but very centred palate, which combines warmth, freshness, savouriness and minerality. Food Pairing: The palate's sangiovese-driven tannic thrust and austerity make this a perfect match for very flavoursome dishes, such as juicy, strongly fragrant meat-based preparations or furred and feathered game of all kinds.